This church is situated on Vladimirsky Prospect. In 1747 during the ruling of the Empress Elizaveta Petrovna the wooden church was erected on this site. The Vladimir Icon of the Mother of God was brought to that church. This icon is the guardian of Russia, sacred to the whole nation. According to the legend the Vladimir Icon was painted by St Luke. St Luke wrote one of the Gos­pels. Now the original icon is kept in the Uspensky Ca­thedral in Moscow. On the 26th of August 1761 the foundation stone of the Church of the Vladimir Icon of the Mother of God was laid. The author of the design is unknown. The build­ing was designed in baroque traditions. The church is beautifully decorated with columns and rich window framings. The church is crowned with five domes rest­ing on tall cylindrical drums. The building of the church was being constructed for eight years. It was completed in 1769. On the 8th of No­vember 1768 the altar of the lower church was sanctified. In 1783 a three-tiered bell-tower was erected near the church. It was designed by the architect Giacomo Quarenghi. This structure is polyhedral in its tower part and round upstairs. 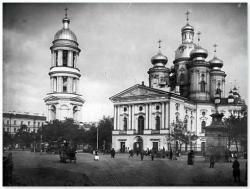 In the same year 1783 the church was consecrated and soon it became one of the most well-known churches in St Petersburg. The writer Fyodor Dostoevsky was a parish­ioner of this church. In 1828 the funeral service for Push­kin’s nanny Arina Rodionovna took place here. In 1831 the architect Abram Melnikov added a portico to the western part of the church building. It was deco­rated with the twinned columns supporting the pediment. But this structure distorted the construction’s stylistic unity. In 1848 the architect Luigi Rusca added one more tier to the bell-tower. It’s said to be one of the best round bell- towers in St Petersburg. The church is famous for its iconostasis. The iconosta­sis was carved in the 18th century. There are some icons on Biblical and mythological subjects painted by the Pe­ter Paul Rubens’s pupils, such as “Descent from the Cross” and “The Holy Family”. On the 22nd of June 1932 the church was closed. All sacred things and values were brought out. The building of the church was given to the Russian National Library. At the end of the 20th century the church was restored. Since 1990 the services are held in the church.